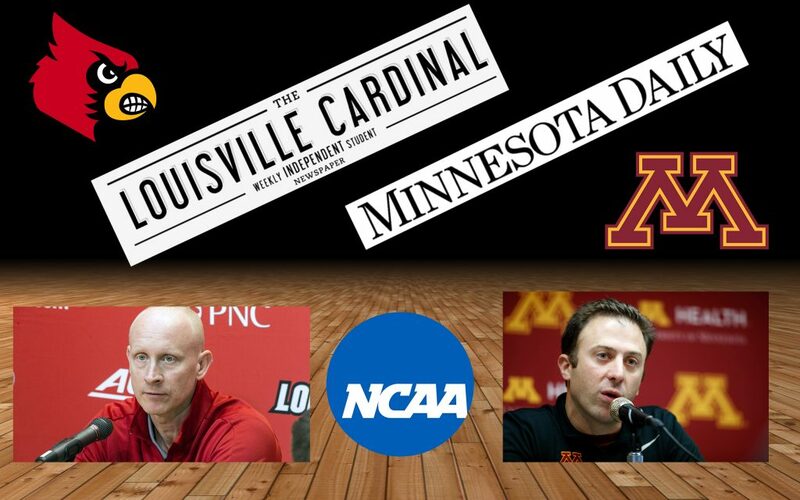 When the NCAA Selection Show revealed a Louisville vs. Minnesota matchup, the name “Pitino” popped up everywhere. Richard Pitino will coach the Golden Gophers against his father’s former Cardinals in the opening game of the Big Dance. That’s the big story, but here’s the important one: Don’t exaggerate the connection. People create most of the drama, while the far more intriguing story is found in the journeys of these two teams to the tournament. Here to provide that story are writers from world-famous student newspapers: The Louisville Cardinal and The Minnesota Daily. You hear from a lot of experts on men’s basketball, why not listen to a couple more? No. 7 Louisville, led by head coach Chris Mack, faces No. 10 Minnesota and Pitino this Thursday. I talked with Nick Jungheim of the Daily about our teams and asked him about preseason expectations, strengths and weaknesses, tournament experience and predictions. Missing out on last year’s tourney and picked to finish 11th in the ACC, Louisville has banded together and competed with the best teams in the country. I expected them to reach the NCAAs, but not to win games like at North Carolina. “Overall, where (Minnesota) is right now is probably about where I expected at the beginning of the season: A lower at-large seed in the NCAA tournament. It’s interesting how they’ve gotten there,” Nick said. “Last season, the team had a lot of injuries. Reggie Lynch got suspended and he was a key player for the Gophers. This season, there have been a few bad losses, that losing streak we went on in February. They didn’t play great during that stretch and they lost to teams they probably should have beaten. But overall, I think there is definitely an expectation among the fans that this would be a bounce-back year,” Nick said. Louisville features a battle-hardened team that played one of the toughest schedules in the country. The Cardinals are not necessarily a tall or extremely athletic team, but they play well when the defense works together as a unit. And when they find a groove from three-point range, and scorers like Jordan Nwora or Dwayne Sutton or Christen Cunningham let loose, they can be hard to stop on offense. “Offensively, their strength all season has been playing in transition. When they can force turnovers and run the court, that’s definitely when they’re at their most effective,” Nick said. “They also have Jordan Murphy as a senior, who is averaging a double-double for this season. It’s almost expected that Jordan Murphy will get a double-double every single game. So when the Gophers are able to run through him, that’s definitely when they’re at their best,” Nick said. “As for weaknesses, they’ve struggled a lot this season to shoot. Other than freshman Gabe Kalscheur, they haven’t found a guy who can consistently make shots from three-point range. Also: Free throw shooting. They don’t really have a guy, down the stretch in close games, who they can count on to go to the line and make clutch shots,” Nick said. It’s arguable whether lack of NCAA tournament experience is a huge hindrance for players, but it can certainly be a factor. Only one player in Louisville’s starting lineup has played in the Big Dance before: Dwayne Sutton (Akoy Agau, Steven Enoch and V. J. King have also played). “I think that, especially for Jordan Murphy, there’s a lot of motivation to go out and win. Because he’s been one of the best players in school history. From the motivational standpoint, the team would really like to get a win for him and Dupree McBrayer as seniors,” Nick said. “But I do think that not having the experience of making a (previous) tournament run at the NCAAs would hurt the team. Coach Pitino did win the NIT with Minnesota a few seasons ago. But in terms of this level, I think that would probably be a concern with this team. Especially if they advance past the first round,” Nick said. “My initial reaction: I don’t know a ton about Louisville, but I know they’ve played a really tough schedule this year. They’ve played a lot of the top teams in the country. As tough of a schedule Louisville played, also with Minnesota going through the Big Ten this year, I think it’s a really interesting matchup in that respect. Both teams have a lot of experience playing games against top opponents. I’m interested to see how that will play out on Thursday,” Nick said. Matt’s prediction – Louisville wins 78-72. Nick’s prediction – Louisville wins 72-66.